In Acanthamoeba cells both Ca and Cd may be precipitated in different cytoplasmic compartments forming electron-opaque deposits, as shown in cells treated with glutaraldehyde supplied with either Ca or Cd respectively. 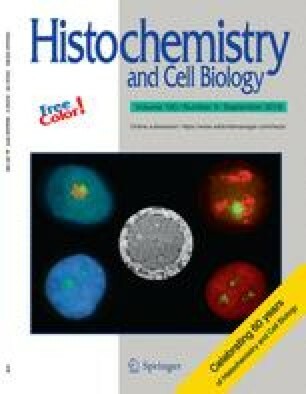 It was found by semiquantitative X-ray microanalysis that the transfer of cells containing Cadeposits to glutaraldehyde supplied with Cd causes a considerable replacement of Ca by Cd: in deposits formed at cell membrane, in cytoplasm, and in mitochondria the total weight percentage of Cd amounted to over 90, only in deposits formed in vacuoles the value was about 80. The replacement was not prevented by the presence of Ca in the transfer medium. When cells containing Cd-deposits were transferred to Ca-supplied medium, Cd predominated as well, its total weight percentage also amounting to over 90 in all the examined deposits. The results suggest that calcium bound in different cell structures may be easily replaced by cadmium, but not conversely, which suggests that Cd is more firmly than calcium linked to many cell constituents well preserved by fixation.